This fraud prevention module will screen every order transacted on LiteCart e-commerce platform in real-time for payment fraud. Its sophisticated validation algorithm will accurately detect the fraud patterns to help you to minimize the chargeback and fraud losses. Please visit the FraudLabs Pro Features page to learn more about the type of fraud validation performed and how it could help you to prevent the payment fraud. Visit the plugin download page on LiteCart. Login to the LiteCart admin area. 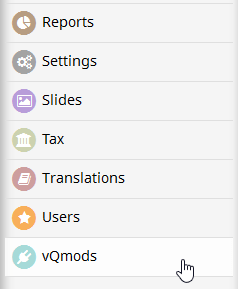 Click on the vQmods menu. On the vQmods page, browse and select the xml file from the unzipped folder. 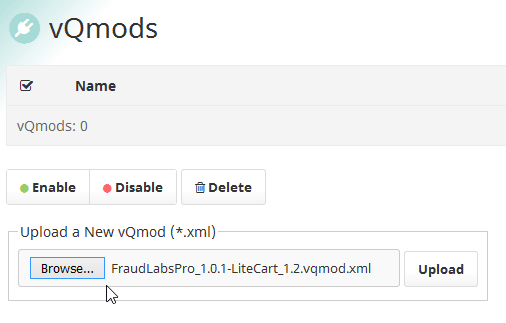 For example, FraudLabsPro_1.0.1-LiteCart_1.2.vqmod.xml. Note: The file name may be different from this tutorial as different filename will be used for new release. Click on Upload button. You should see the below screen if the fraud prevention module was successfully installed. Click on the Settings and then click on the Security menu. Set Enabled to True and enter the FraudLabs Pro API Key.